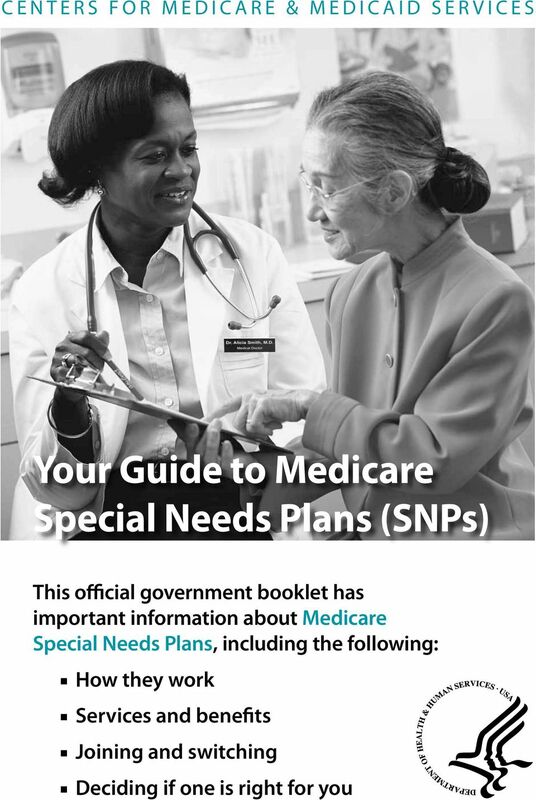 Download "Your Guide to Medicare Special Needs Plans (SNPs)"
2 The information in this guide was correct when it was printed. Changes may occur after printing. Call MEDICARE ( ), or visit to get the most current information. 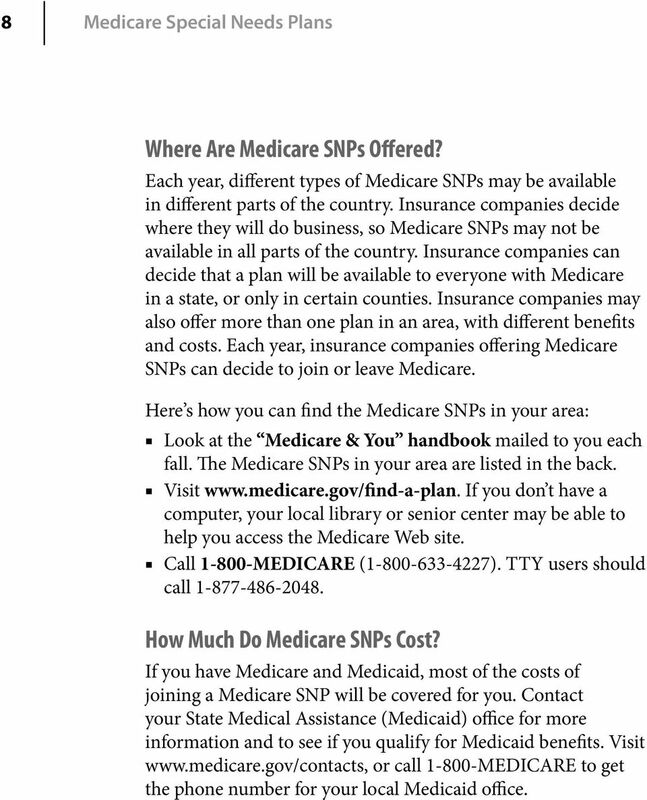 TTY users should call Your Guide to Medicare Special Needs Plans (SNPs) isn t a legal document. Official Medicare Program legal guidance is contained in the relevant statutes, regulations, and rulings. 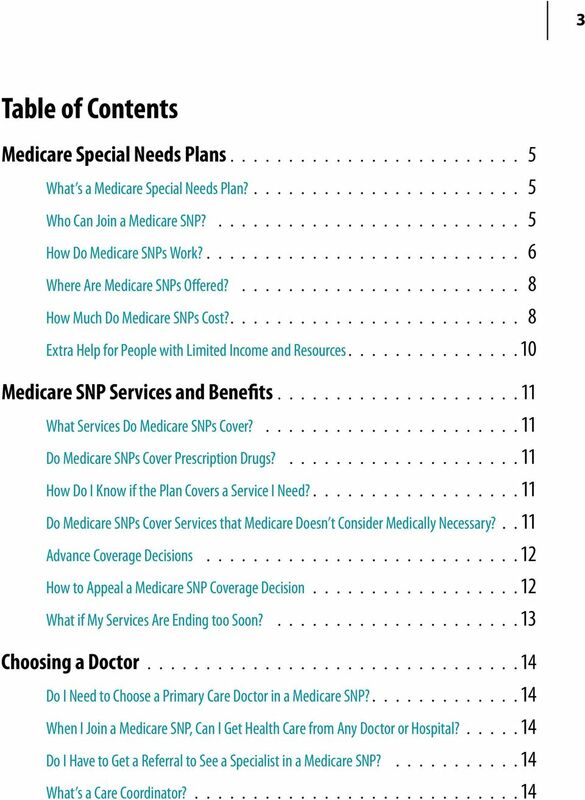 3 3 Table of Contents Medicare Special Needs Plans What s a Medicare Special Needs Plan? Who Can Join a Medicare SNP? How Do Medicare SNPs Work? Where Are Medicare SNPs Offered? How Much Do Medicare SNPs Cost? Extra Help for People with Limited Income and Resources Medicare SNP Services and Benefits What Services Do Medicare SNPs Cover? Do Medicare SNPs Cover Prescription Drugs? How Do I Know if the Plan Covers a Service I Need? Do Medicare SNPs Cover Services that Medicare Doesn t Consider Medically Necessary?.. 11 Advance Coverage Decisions How to Appeal a Medicare SNP Coverage Decision What if My Services Are Ending too Soon? Choosing a Doctor Do I Need to Choose a Primary Care Doctor in a Medicare SNP? When I Join a Medicare SNP, Can I Get Health Care from Any Doctor or Hospital? Do I Have to Get a Referral to See a Specialist in a Medicare SNP? What s a Care Coordinator? 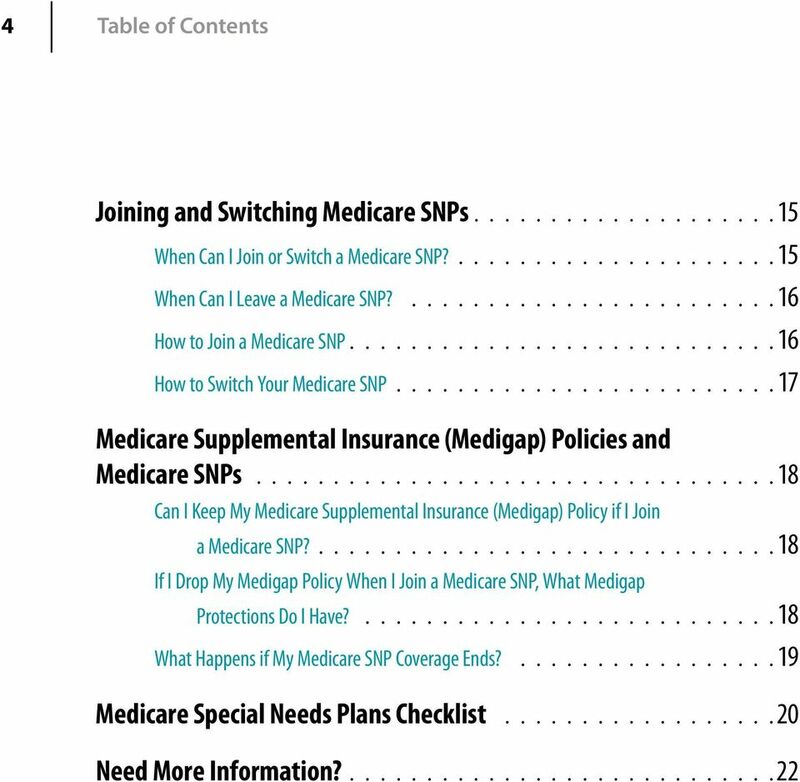 4 4 Table of Contents Joining and Switching Medicare SNPs When Can I Join or Switch a Medicare SNP? When Can I Leave a Medicare SNP? 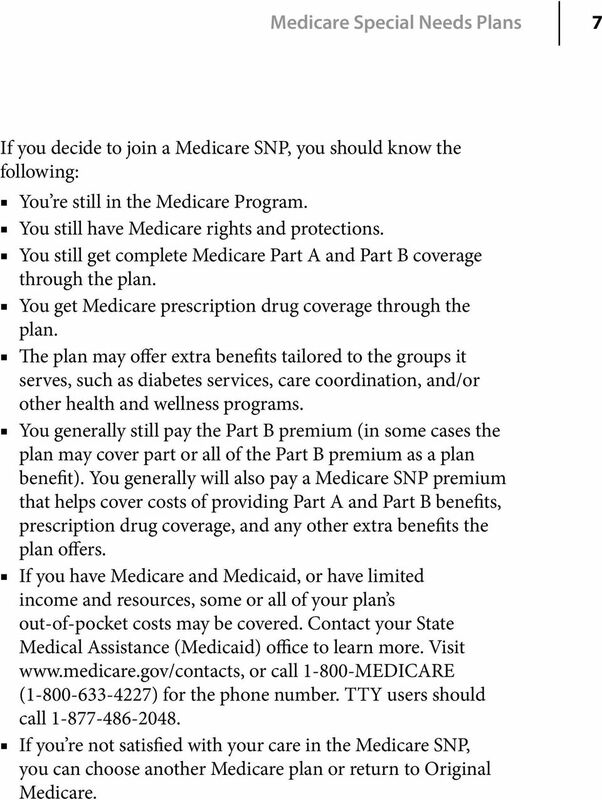 How to Join a Medicare SNP How to Switch Your Medicare SNP Medicare Supplemental Insurance (Medigap) Policies and Medicare SNPs Can I Keep My Medicare Supplemental Insurance (Medigap) Policy if I Join a Medicare SNP? 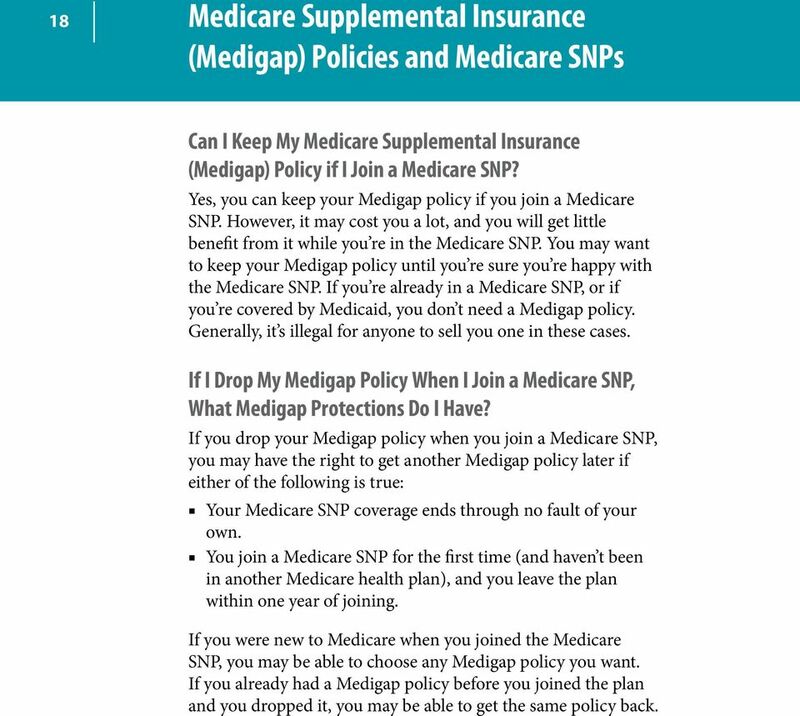 If I Drop My Medigap Policy When I Join a Medicare SNP, What Medigap Protections Do I Have? What Happens if My Medicare SNP Coverage Ends? Medicare Special Needs Plans Checklist Need More Information? 5 Medicare Special Needs Plans 5 What s a Medicare Special Needs Plan? Medicare Special Needs Plans (SNPs) are a type of Medicare Advantage Plan (like an HMO or PPO). Medicare SNPs limit membership to people with specific diseases or characteristics, and tailor their benefits, provider choices, and drug formularies (list of covered drugs) to best meet the specific needs of the groups they serve. Who Can Join a Medicare SNP? 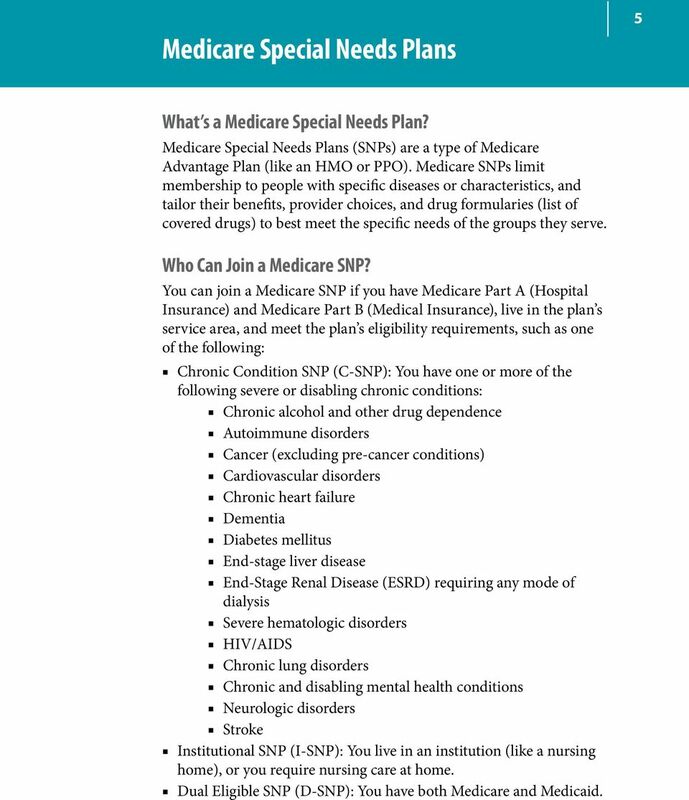 You can join a Medicare SNP if you have Medicare Part A (Hospital Insurance) and Medicare Part B (Medical Insurance), live in the plan s service area, and meet the plan s eligibility requirements, such as one of the following: Chronic Condition SNP (C-SNP): You have one or more of the following severe or disabling chronic conditions: Chronic alcohol and other drug dependence Autoimmune disorders Cancer (excluding pre-cancer conditions) Cardiovascular disorders Chronic heart failure Dementia Diabetes mellitus End-stage liver disease End-Stage Renal Disease (ESRD) requiring any mode of dialysis Severe hematologic disorders HIV/AIDS Chronic lung disorders Chronic and disabling mental health conditions Neurologic disorders Stroke Institutional SNP (I-SNP): You live in an institution (like a nursing home), or you require nursing care at home. 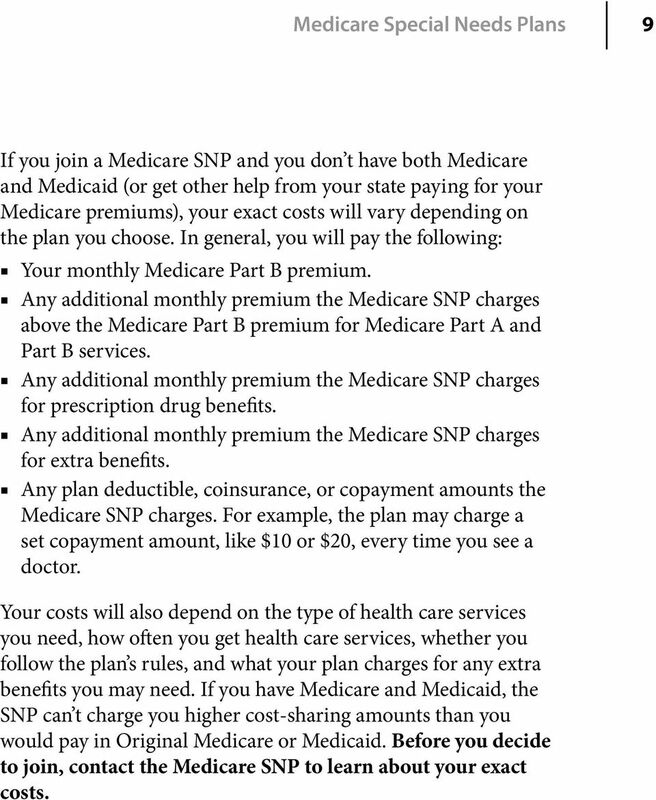 Dual Eligible SNP (D-SNP): You have both Medicare and Medicaid. 6 6 Medicare Special Needs Plans Each Medicare SNP limits its membership to people in one of these groups, or a subset of one of these groups. For example, a Medicare SNP may be designed to serve only people diagnosed with congestive heart failure. The plan might include access to a network of providers who specialize in treating congestive heart failure, and it would feature clinical case management programs designed to serve the special needs of people with this condition. The plan s drug formulary would be designed to cover the drugs usually used to treat congestive heart failure. People who join this plan would get benefits specially tailored to their condition, and have all their care coordinated through the Medicare SNP. Contact the plan you re interested in or review plan materials to see if you meet the plan s conditions for membership. For more information about joining a Medicare SNP, see page 15. How Do Medicare SNPs Work? Medicare SNPs are approved by Medicare and run by private companies. When you join a Medicare SNP, you get all your Medicare hospital, medical health care services, and prescription drug coverage through that plan. Because they offer all health care services through a single plan, Medicare SNPs can help you manage your different services and providers. They can make it easier for you to follow your doctor s orders related to diet and prescription drug use. 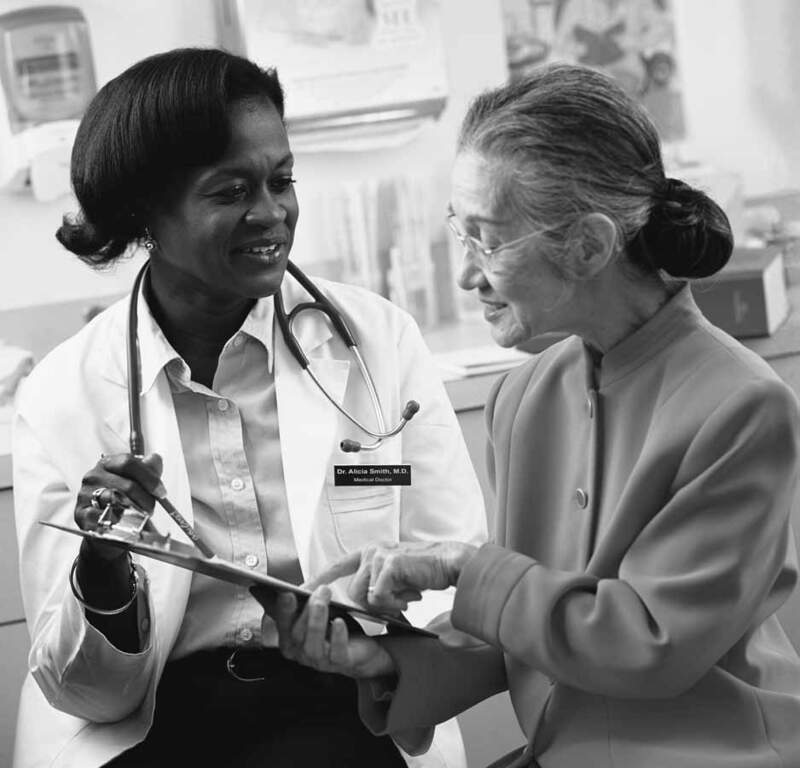 Medicare SNPs for people with both Medicare and Medicaid may also help people get help from the community and coordinate many Medicare and Medicaid services. Just like with other Medicare health plans, if you join a Medicare SNP, you will have to see providers who belong to the plan, or use certain hospitals to get covered services. In most cases, you will need referrals to see specialists. The Medicare SNP will still cover emergency or urgently needed care, even if you re out of the plan s service area. 7 Medicare Special Needs Plans 7 If you decide to join a Medicare SNP, you should know the following: You re still in the Medicare Program. You still have Medicare rights and protections. You still get complete Medicare Part A and Part B coverage through the plan. You get Medicare prescription drug coverage through the plan. The plan may offer extra benefits tailored to the groups it serves, such as diabetes services, care coordination, and/or other health and wellness programs. You generally still pay the Part B premium (in some cases the plan may cover part or all of the Part B premium as a plan benefit). You generally will also pay a Medicare SNP premium that helps cover costs of providing Part A and Part B benefits, prescription drug coverage, and any other extra benefits the plan offers. If you have Medicare and Medicaid, or have limited income and resources, some or all of your plan s out-of-pocket costs may be covered. Contact your State Medical Assistance (Medicaid) office to learn more. Visit or call MEDICARE ( ) for the phone number. TTY users should call If you re not satisfied with your care in the Medicare SNP, you can choose another Medicare plan or return to Original Medicare. 8 8 Medicare Special Needs Plans Where Are Medicare SNPs Offered? Each year, different types of Medicare SNPs may be available in different parts of the country. Insurance companies decide where they will do business, so Medicare SNPs may not be available in all parts of the country. Insurance companies can decide that a plan will be available to everyone with Medicare in a state, or only in certain counties. Insurance companies may also offer more than one plan in an area, with different benefits and costs. Each year, insurance companies offering Medicare SNPs can decide to join or leave Medicare. Here s how you can find the Medicare SNPs in your area: Look at the Medicare & You handbook mailed to you each fall. The Medicare SNPs in your area are listed in the back. Visit If you don t have a computer, your local library or senior center may be able to help you access the Medicare Web site. Call MEDICARE ( ). TTY users should call How Much Do Medicare SNPs Cost? 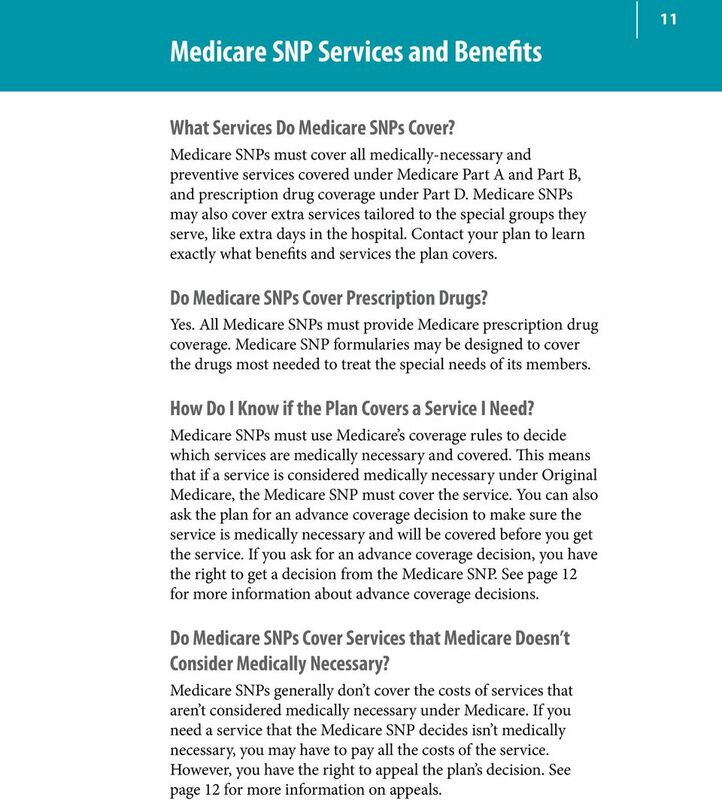 If you have Medicare and Medicaid, most of the costs of joining a Medicare SNP will be covered for you. Contact your State Medical Assistance (Medicaid) office for more information and to see if you qualify for Medicaid benefits. Visit or call MEDICARE to get the phone number for your local Medicaid office. 9 Medicare Special Needs Plans 9 If you join a Medicare SNP and you don t have both Medicare and Medicaid (or get other help from your state paying for your Medicare premiums), your exact costs will vary depending on the plan you choose. In general, you will pay the following: Your monthly Medicare Part B premium. Any additional monthly premium the Medicare SNP charges above the Medicare Part B premium for Medicare Part A and Part B services. Any additional monthly premium the Medicare SNP charges for prescription drug benefits. Any additional monthly premium the Medicare SNP charges for extra benefits. Any plan deductible, coinsurance, or copayment amounts the Medicare SNP charges. For example, the plan may charge a set copayment amount, like $10 or $20, every time you see a doctor. Your costs will also depend on the type of health care services you need, how often you get health care services, whether you follow the plan s rules, and what your plan charges for any extra benefits you may need. If you have Medicare and Medicaid, the SNP can t charge you higher cost-sharing amounts than you would pay in Original Medicare or Medicaid. Before you decide to join, contact the Medicare SNP to learn about your exact costs. 10 10 Medicare Special Needs Plans Extra Help for People with Limited Income and Resources All Medicare SNPs include Medicare prescription drug coverage. Usually, you pay a copayment for your prescriptions. If you have limited income and resources, you may be able to get Extra Help paying your prescription drug coverage costs. People who qualify may be able to get their prescriptions filled and pay little or nothing out of pocket. You can apply for Extra Help at any time. There is no cost or obligation to apply for Extra Help, so anyone who thinks they might qualify should apply. To apply for Extra Help paying for Medicare prescription drug coverage, visit or call Social Security at TTY users should call You can also visit your State Medical Assistance (Medicaid) office. After you apply, you will get a letter in the mail letting you know what to do next. 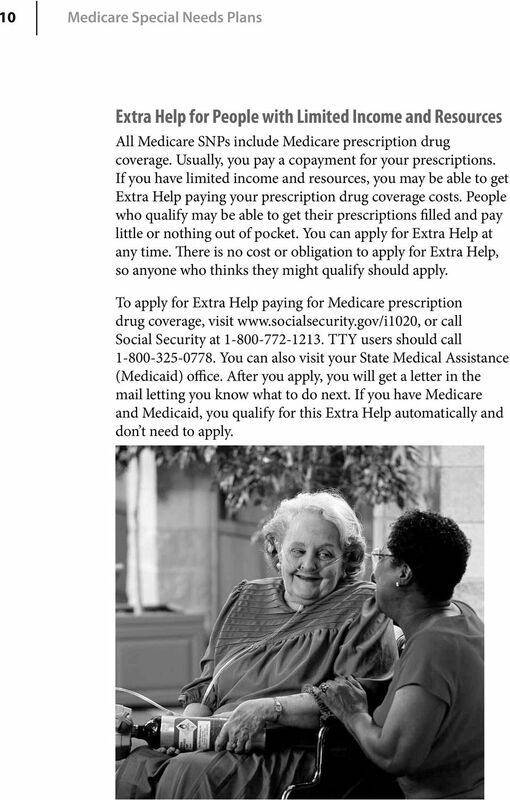 If you have Medicare and Medicaid, you qualify for this Extra Help automatically and don t need to apply. 11 Medicare SNP Services and Benefits 11 What Services Do Medicare SNPs Cover? Medicare SNPs must cover all medically-necessary and preventive services covered under Medicare Part A and Part B, and prescription drug coverage under Part D. Medicare SNPs may also cover extra services tailored to the special groups they serve, like extra days in the hospital. Contact your plan to learn exactly what benefits and services the plan covers. Do Medicare SNPs Cover Prescription Drugs? Yes. All Medicare SNPs must provide Medicare prescription drug coverage. Medicare SNP formularies may be designed to cover the drugs most needed to treat the special needs of its members. How Do I Know if the Plan Covers a Service I Need? Medicare SNPs must use Medicare s coverage rules to decide which services are medically necessary and covered. This means that if a service is considered medically necessary under Original Medicare, the Medicare SNP must cover the service. You can also ask the plan for an advance coverage decision to make sure the service is medically necessary and will be covered before you get the service. 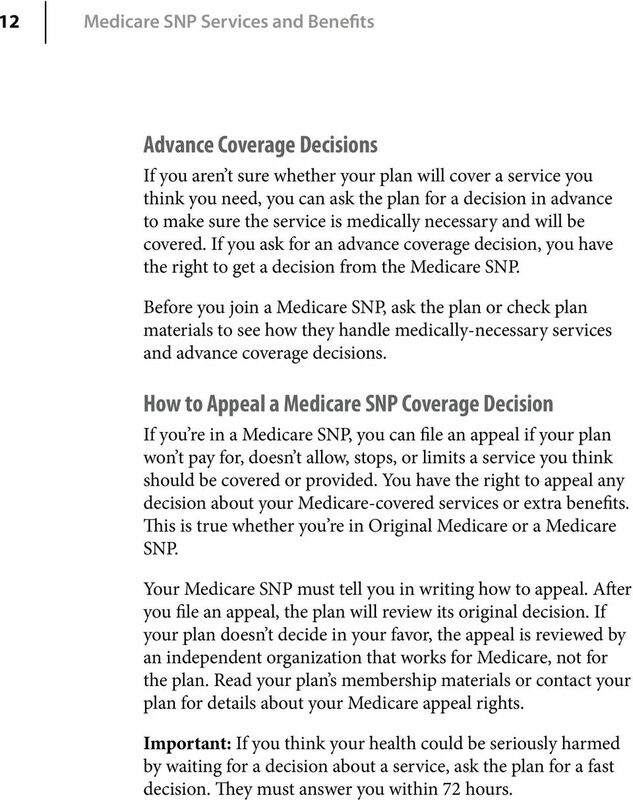 If you ask for an advance coverage decision, you have the right to get a decision from the Medicare SNP. See page 12 for more information about advance coverage decisions. Do Medicare SNPs Cover Services that Medicare Doesn t Consider Medically Necessary? Medicare SNPs generally don t cover the costs of services that aren t considered medically necessary under Medicare. If you need a service that the Medicare SNP decides isn t medically necessary, you may have to pay all the costs of the service. However, you have the right to appeal the plan s decision. See page 12 for more information on appeals. 12 12 Medicare SNP Services and Benefits Advance Coverage Decisions If you aren t sure whether your plan will cover a service you think you need, you can ask the plan for a decision in advance to make sure the service is medically necessary and will be covered. If you ask for an advance coverage decision, you have the right to get a decision from the Medicare SNP. 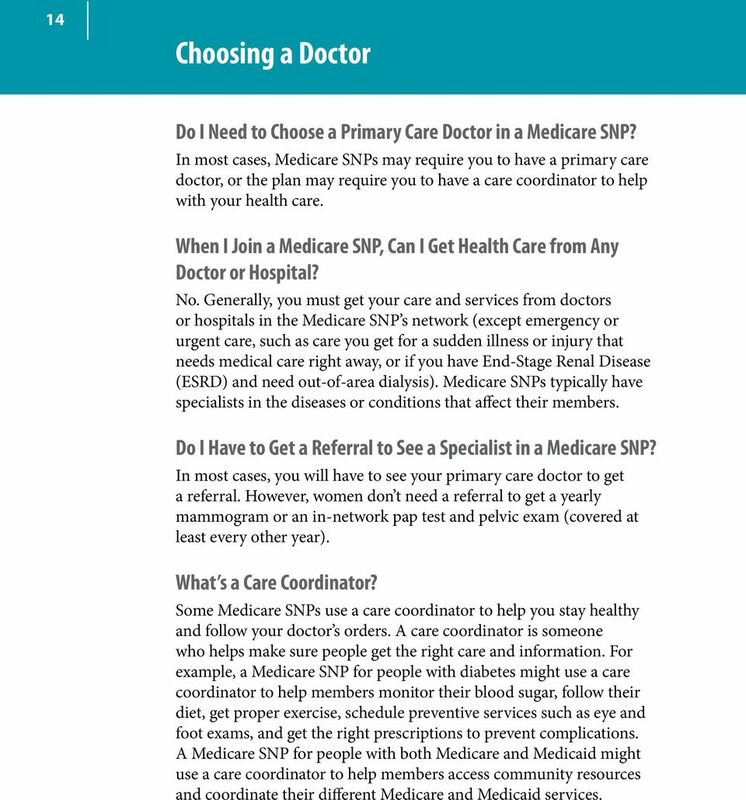 Before you join a Medicare SNP, ask the plan or check plan materials to see how they handle medically-necessary services and advance coverage decisions. How to Appeal a Medicare SNP Coverage Decision If you re in a Medicare SNP, you can file an appeal if your plan won t pay for, doesn t allow, stops, or limits a service you think should be covered or provided. You have the right to appeal any decision about your Medicare-covered services or extra benefits. This is true whether you re in Original Medicare or a Medicare SNP. Your Medicare SNP must tell you in writing how to appeal. After you file an appeal, the plan will review its original decision. If your plan doesn t decide in your favor, the appeal is reviewed by an independent organization that works for Medicare, not for the plan. Read your plan s membership materials or contact your plan for details about your Medicare appeal rights. Important: If you think your health could be seriously harmed by waiting for a decision about a service, ask the plan for a fast decision. They must answer you within 72 hours. 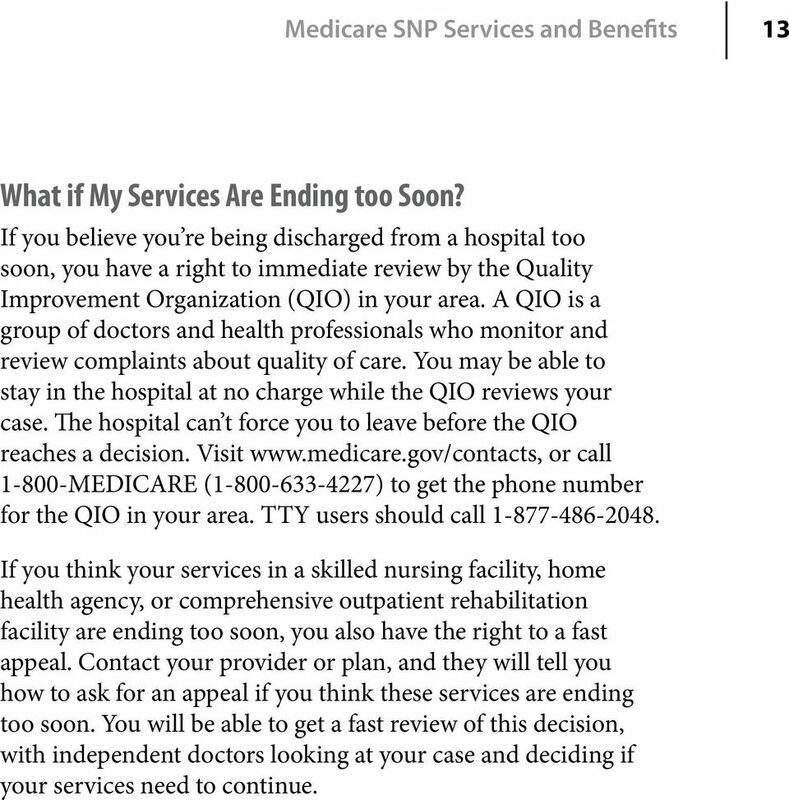 13 Medicare SNP Services and Benefits 13 What if My Services Are Ending too Soon? If you believe you re being discharged from a hospital too soon, you have a right to immediate review by the Quality Improvement Organization (QIO) in your area. A QIO is a group of doctors and health professionals who monitor and review complaints about quality of care. You may be able to stay in the hospital at no charge while the QIO reviews your case. The hospital can t force you to leave before the QIO reaches a decision. Visit or call MEDICARE ( ) to get the phone number for the QIO in your area. TTY users should call If you think your services in a skilled nursing facility, home health agency, or comprehensive outpatient rehabilitation facility are ending too soon, you also have the right to a fast appeal. Contact your provider or plan, and they will tell you how to ask for an appeal if you think these services are ending too soon. You will be able to get a fast review of this decision, with independent doctors looking at your case and deciding if your services need to continue. 14 14 Choosing a Doctor Do I Need to Choose a Primary Care Doctor in a Medicare SNP? In most cases, Medicare SNPs may require you to have a primary care doctor, or the plan may require you to have a care coordinator to help with your health care. When I Join a Medicare SNP, Can I Get Health Care from Any Doctor or Hospital? No. Generally, you must get your care and services from doctors or hospitals in the Medicare SNP s network (except emergency or urgent care, such as care you get for a sudden illness or injury that needs medical care right away, or if you have End-Stage Renal Disease (ESRD) and need out-of-area dialysis). Medicare SNPs typically have specialists in the diseases or conditions that affect their members. Do I Have to Get a Referral to See a Specialist in a Medicare SNP? In most cases, you will have to see your primary care doctor to get a referral. However, women don t need a referral to get a yearly mammogram or an in-network pap test and pelvic exam (covered at least every other year). What s a Care Coordinator? Some Medicare SNPs use a care coordinator to help you stay healthy and follow your doctor s orders. 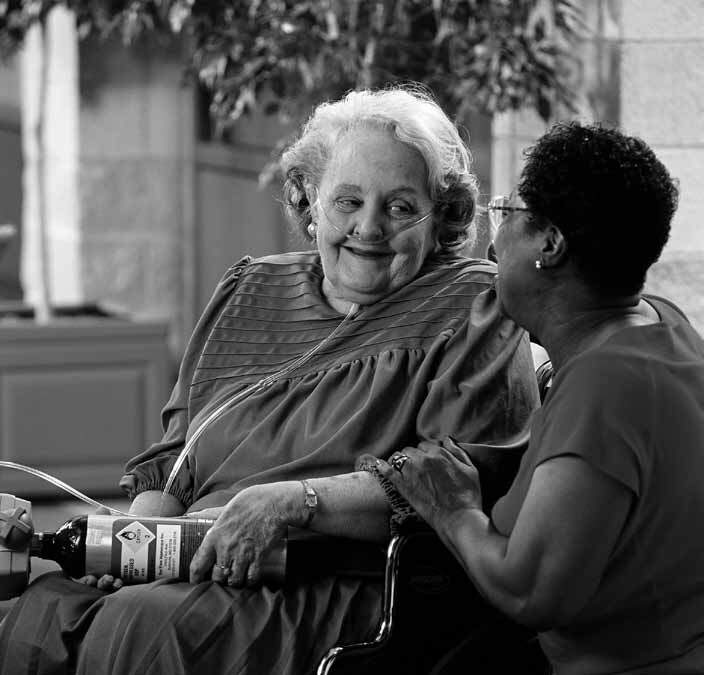 A care coordinator is someone who helps make sure people get the right care and information. For example, a Medicare SNP for people with diabetes might use a care coordinator to help members monitor their blood sugar, follow their diet, get proper exercise, schedule preventive services such as eye and foot exams, and get the right prescriptions to prevent complications. A Medicare SNP for people with both Medicare and Medicaid might use a care coordinator to help members access community resources and coordinate their different Medicare and Medicaid services. 15 Joining and Switching Medicare SNPs 15 When Can I Join or Switch a Medicare SNP? 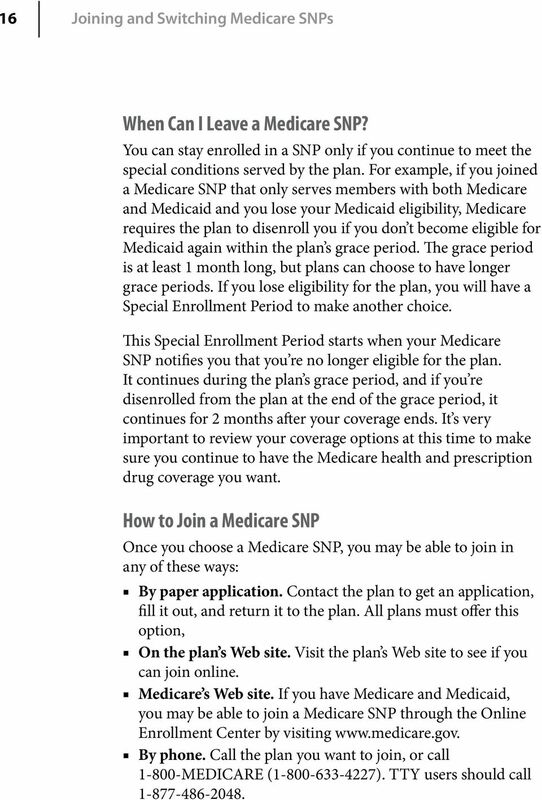 The chart lists the times you may be able to join a Medicare SNP or switch out of a Medicare SNP to a different plan. Who can join or switch? If you have Medicare and get help from Medicaid (your state), or you live in an institution like a nursing home or hospital If you re newly eligible for Medicare When can you join or switch? 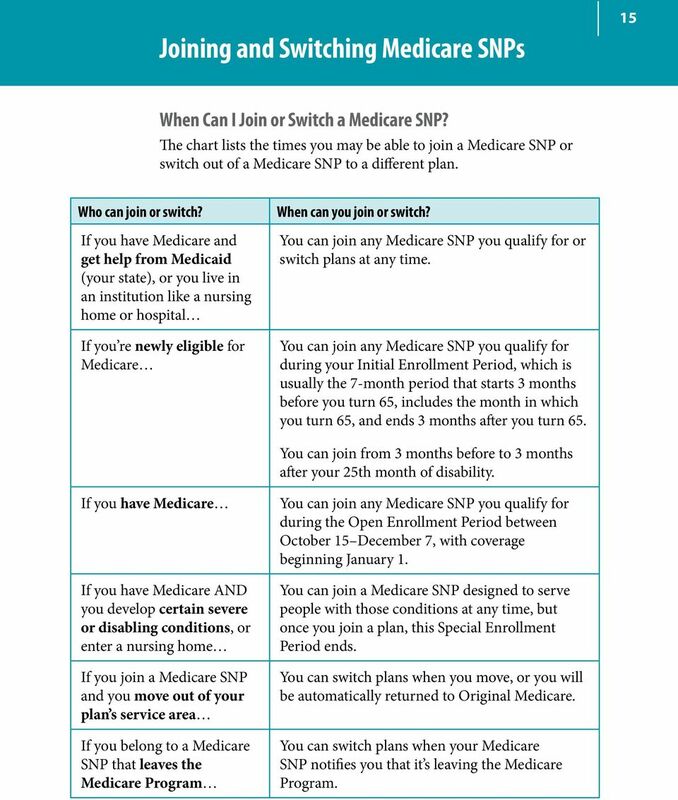 You can join any Medicare SNP you qualify for or switch plans at any time. You can join any Medicare SNP you qualify for during your Initial Enrollment Period, which is usually the 7-month period that starts 3 months before you turn 65, includes the month in which you turn 65, and ends 3 months after you turn 65. You can join from 3 months before to 3 months after your 25th month of disability. If you have Medicare If you have Medicare AND you develop certain severe or disabling conditions, or enter a nursing home If you join a Medicare SNP and you move out of your plan s service area If you belong to a Medicare SNP that leaves the Medicare Program You can join any Medicare SNP you qualify for during the Open Enrollment Period between October 15 December 7, with coverage beginning January 1. You can join a Medicare SNP designed to serve people with those conditions at any time, but once you join a plan, this Special Enrollment Period ends. You can switch plans when you move, or you will be automatically returned to Original Medicare. 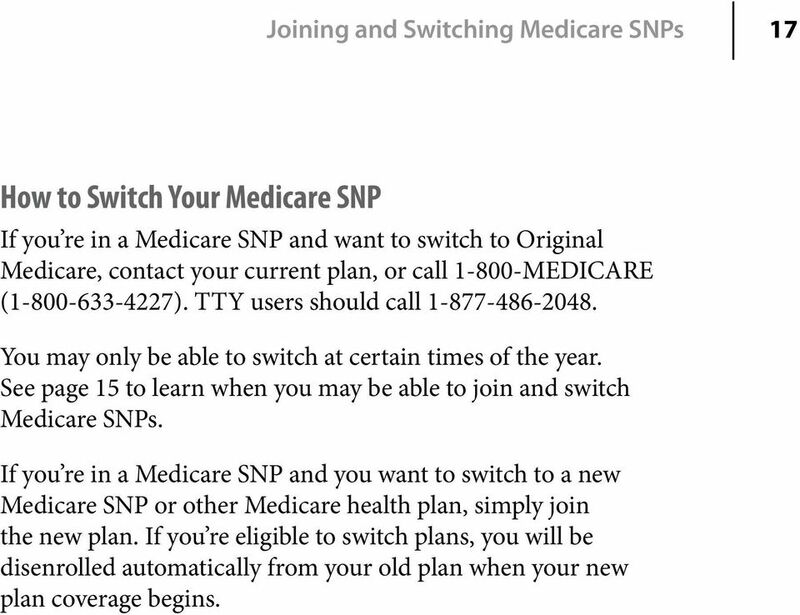 You can switch plans when your Medicare SNP notifies you that it s leaving the Medicare Program. 17 Joining and Switching Medicare SNPs 17 How to Switch Your Medicare SNP If you re in a Medicare SNP and want to switch to Original Medicare, contact your current plan, or call MEDICARE ( ). TTY users should call You may only be able to switch at certain times of the year. 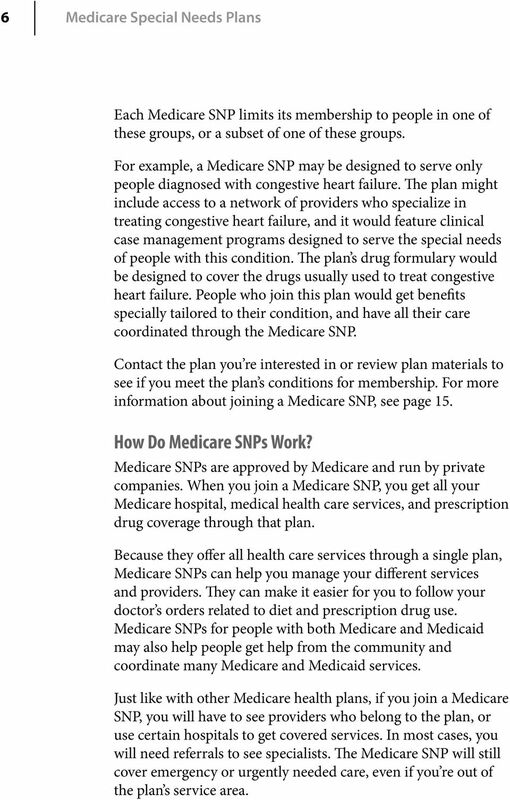 See page 15 to learn when you may be able to join and switch Medicare SNPs. If you re in a Medicare SNP and you want to switch to a new Medicare SNP or other Medicare health plan, simply join the new plan. If you re eligible to switch plans, you will be disenrolled automatically from your old plan when your new plan coverage begins. 18 18 Medicare Supplemental Insurance (Medigap) Policies and Medicare SNPs Can I Keep My Medicare Supplemental Insurance (Medigap) Policy if I Join a Medicare SNP? Yes, you can keep your Medigap policy if you join a Medicare SNP. However, it may cost you a lot, and you will get little benefit from it while you re in the Medicare SNP. You may want to keep your Medigap policy until you re sure you re happy with the Medicare SNP. If you re already in a Medicare SNP, or if you re covered by Medicaid, you don t need a Medigap policy. Generally, it s illegal for anyone to sell you one in these cases. 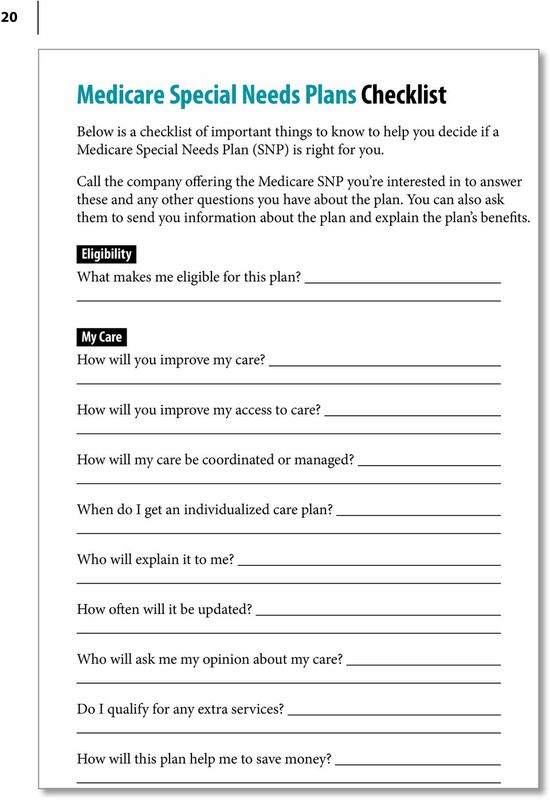 If I Drop My Medigap Policy When I Join a Medicare SNP, What Medigap Protections Do I Have? If you drop your Medigap policy when you join a Medicare SNP, you may have the right to get another Medigap policy later if either of the following is true: Your Medicare SNP coverage ends through no fault of your own. You join a Medicare SNP for the first time (and haven t been in another Medicare health plan), and you leave the plan within one year of joining. If you were new to Medicare when you joined the Medicare SNP, you may be able to choose any Medigap policy you want. If you already had a Medigap policy before you joined the plan and you dropped it, you may be able to get the same policy back. 19 Medigap Policies and Medicare SNPs 19 What Happens if My Medicare SNP Coverage Ends? If your Medicare SNP coverage ends, or your plan stops providing care in your area, you can join another Medicare plan, if one is available, or you can return to Original Medicare. Generally, if you return to Original Medicare, you may also have the right to buy a Medigap policy. 20 20 Medicare Special Needs Plans Checklist Below is a checklist of important things to know to help you decide if a Medicare Special Needs Plan (SNP) is right for you. Call the company offering the Medicare SNP you re interested in to answer these and any other questions you have about the plan. You can also ask them to send you information about the plan and explain the plan s benefits. Eligibility What makes me eligible for this plan? My Care How will you improve my care? How will you improve my access to care? How will my care be coordinated or managed? When do I get an individualized care plan? Who will explain it to me? How often will it be updated? Who will ask me my opinion about my care? Do I qualify for any extra services? How will this plan help me to save money? 22 22 Need More Information? There are several places you can go to get more information about Medicare SNPs or to find out what Medicare SNPs are available in your area: Look at the Medicare & You handbook mailed to you in the fall. The Medicare SNPs in your area are listed in the back. Visit If you don t have a computer, your local library or senior center may be able to help you access the Medicare Web site. Call MEDICARE ( ). TTY users should call Call your local State Health Insurance Assistance Program (SHIP) for help with choosing and joining a Medicare SNP, payment denials or appeals, Medicare rights and protections, complaints about your care or treatment, or Medicare bills. For the phone number of the SHIP office near you, visit or call MEDICARE. Medicare Advantage Plans: What is it and what does it cover? Are You a Hospital Inpatient or Outpatient? If You Have Medicare Ask!